The 10-year Treasury yield, which influences mortgages and other business and consumer loans, looks set to break higher, strategists say. The Fed is meeting Tuesday and Wednesday and is expected to raise rates by a quarter point, but it is the Fed comments that could determine how much yields move higher. Strategists do not foresee runaway yields, but they do say the 10-year could head into higher territory. Potential homebuyers exit an open house in Redondo Beach, California. The key rate that affects mortgages and a slew of other loans is looking ready to break higher. 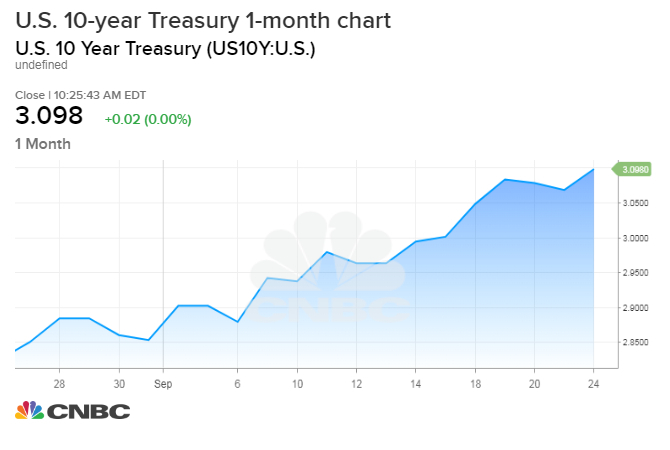 The benchmark 10-year Treasury yield briefly touched a high yield of just over 3.113 percent Tuesday morning, just as the Fed began it two-day meeting. That is the highest level since May 18, when the 10-year yield hit a high of 3.128 percent. "As far as direction, I think if you see a decent break above 3.11, let's say it goes to 3.15, I would say the next stop is 3.30, 3.40," said Michael Schumacher, director rate strategy at Wells Fargo. "I think the big shift psychologically is the average hourly earnings, and that made people think this wage increase is real and that's the one piece of the puzzle the central banks didn't have." That wage report for August, which came out on Sept. 7, showed hourly wages grew on 2.9 percent on an annual basis. The 10-year yield has moved higher since then, since it implies inflation could be picking up — meaning the Fed could have to become more active. "It's going to break higher, but not one of these 50 basis point moves where the market would take notice. We've had a stealth sell-off already and equities have held in," said George Goncalves, head of fixed income strategy at Nomura. Goncalves said if the yield reaches 3.128 percent, the May high, it could start heading to 3.25 percent. "If we break the 3.13 level and the Fed is clearly still hiking, the next port of call is going to be 3.25. It's a matter of when, not if. The next key level is 3.50, and at that point, that's where the rubber meets the road for equities and credit, and things like that," he said. "That could slow it down." Even though many strategists see the 10-year reaching 3.25 percent this year, they do not expect runaway yields. Much higher yields would spook the stock market, and strategists caution that a sell-off in stocks would create a flight-to-safety trade back into bonds. That would send yields lower, since they move inversely to price. The U.S. 10-year also responds to moves in overseas markets, and comments form European Central Bank President Mario Draghi on Monday boosted German bund yields. Draghi's comment also reminded markets that central bankers around the world are following the Fed's move toward more normal rates, though at a much slower pace. The Fed is expected to raise its fed funds target rate range to 2 to 2.25 percent Wednesday, and that is the rate that most directly impacts the shorter end of the curve, like the 2-year Treasury note. The 2-year touched a high of 2.84 percent earlier Tuesday, the highest level since June 2008. The futures market has been pricing in more aggressive Fed rate hikes since that wage report, with the fed funds rate now pricing in a December rate hike and two more for next year, in addition to the September rate hike. The Fed has forecast three rate hikes for next year, but the market, until recently, has doubted it would do more than one. Schumacher said if Fed Chairman Jerome Powell is even just slightly hawkish, the market could move to price in a more hawkish Fed for next year. Even a quarter-point hike in Fed funds could move up the 2-year by 20 basis points, so it could move higher just on the Fed outlook. The Fed also provides new forecasts for the economy and interest rates after its meeting Wednesday. "If we get a third hike priced in [for 2019] that would push the 2-year up about 20 basis points. ... You have to think the 10-year goes up. It's almost like a balloon. Everything rises," Schumacher said. The shorter-term rates affect things like credit card rates, while the 10-year influences mortgages. The average rate on the popular 30-year fixed mortgage loan has climbed to a seven-year high in the past month and is closing in on 5 percent, a level not seen in nearly a decade.